Back in the 1990s, it was all the rage to bring back dwarf turtles from Asian summer trips. As people realized they had to take care of them as well and buy aquariums, foodstuffs and such, the animals were abandoned and let loose in English ponds. There, they soon multiplied and terrorized the fauna already present. There is a similar story about a cat brought along by a lighthouse keeper to a Polynesian island off the coast of New Zealand in the 1800s, where the cat ravaged the flightless bird population called the Stephens Island Wren present over there. Those birds had apparently never seen cats. What I am getting at, let us hope that the following spotting in central London is not the start of a boa constrictor invasion. Related coverage: <a href="https://thegoldwater.com/news/32743-California-14-Foot-Python-on-the-Loose-in-Redding-After-Escaping-Carr-Fire">14 foot python on the loose in California</a>. 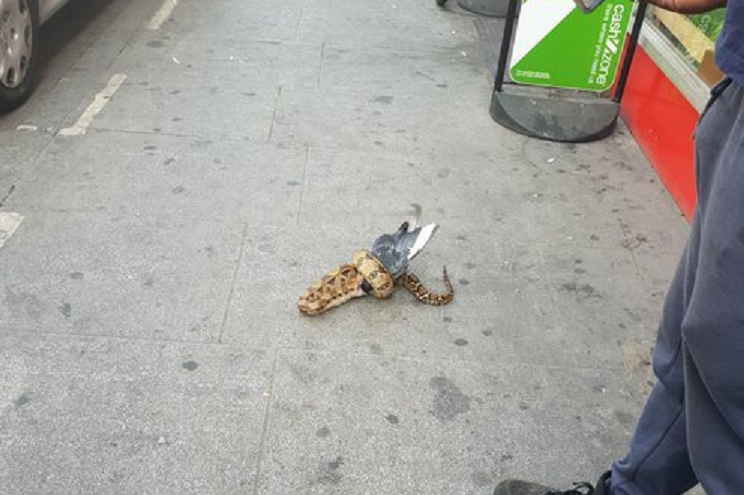 Mr Dave Fawbert slowly became internet famous over the weekend because of his sighting of a snake eating a pigeon, a sighting confirmed by others who posted videos and pictures all over social media. Although many believed it to be a python at first, the charity that came to pick up the animal, believed to have been an abandoned pet by a Londoner, explained the reptile is a boa constrictor. The event took place on High Road, Leytonstone, a busy east London street near the shopping venues. He then funnily added how he had hoped to see a live snake on a safari in Africa a few years ago, but never managed to at the time: "I never did in Tanzania, but I guess now I have."